H1 receptor antagonists are commonly used for the treatment of allergic diseases. The aim of this study was to find out, if antihistaminic compounds like mepyramine have the ability to influence the activity of antibacterials. Therefore, the checkerboard method was chosen to detect these possible effects in vitro. Studies were performed with two different Escherichia coli (E. coli) strains as test microbes, treated with antibacterials in combination with mepyramine. The minimum inhibitory concentration (MIC) of E. coli ATCC® 25922™ and E. coli PIG 01 was reduced by combinations of the tested antibacterials with mepyramine. These results have to be confirmed in vivo, before the use of antihistamines should be considered as potential way to minimize the amount of used antibacterials for treatment of E. coli infections. As mentioned by World Health Organization, BVL (Federal Office of Consumer Protection and Food Safety, Germany) and various other governmental and non-governmental organizations the number of infections caused by resistant bacteria is increasing in recent years in human beings and animals. For a targeted reduction of resistance new treatment options of infections are required. Brennan-Krohn et al. showed synergistic effects of combinations of minocycline and colistin as well as minocycline and meropenem. In addition, Maier et al. discovered antibacterial effects of various non antibiotic compounds, for example loratadine. El-Banna et al. already described the modulation of antibiotic efficacy by antihistaminic drugs against Klebsiella pneumoniae. It is also known that various bacteria (for example Lactobacillus reuteri and Escherichia coli) produce histamine under defined circumstances [4, 5], although the biological significance remains unclear. This mechanism leads to the hypothesis of the described study, that antihistamines potentiate the efficacy of antibacterials. Therefore, an investigation of interactions between antibacterial agents and histamine H1 receptor antagonists on the growth of E. coli was performed. E. coli is commonly found in the lower intestine of numerous animals and human beings as part of the commensal microbiota . Two different E. coli strains were used. The first strain, E. coli ATCC® 25922™ represents a reference strain for antimicrobial susceptibility testing and is sensitive for enrofloxacin. The second strain (E. coli PIG 01) was isolated from pigs in own experiments and is resistant to enrofloxacin. El-Nakeeb et al. already described growth-inhibiting effects on bacteria for H1 antihistaminic compounds like mepyramine, which represents a first generation H1 antihistamine . Eight conventionally used antibacterials in veterinary medicine including amoxicillin, sulfadiazine/trimethoprim, tetracycline, colistin, enrofloxacin, florfenicol, gentamicin and kanamycin were tested in combination with mepyramine in vitro (checkerboard method). Compared with the MIC of the compounds alone the MIC values of amoxicillin (penicillins), sulfadiazine combined with trimethoprim (trimethoprim-potentiated sulfonamides), colistin (polymyxins), enrofloxacin (fluoroquinolones), tetracycline (tetracyclines) and florfenicol were lower when combined with mepyramine (Table 1). For the combination of gentamicin (aminoglycosides) with mepyramine no interaction was found. Therefore, another aminoglycoside (kanamycin) was tested, which also showed no interaction. To exclude possible pH effects, pH changes were measured at 0 and 24 h of incubation for the combination of enrofloxacin and mepyramine. No pH changes were found. The highest dose reduction index (DRI) was calculated for colistin and florfenicol. 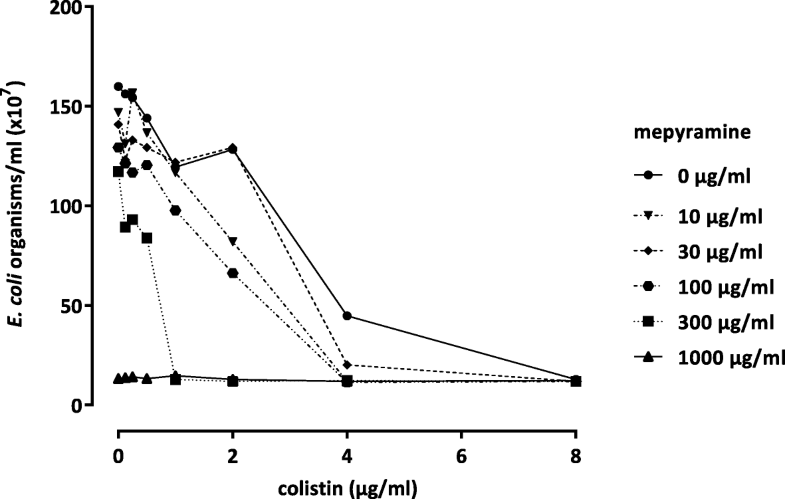 For colistin in combination with mepyramine the MIC of E. coli ATCC® 25922™ was reduced from 8.0 to 1.0 μg/ml (Fig. 1). In addition, for florfenicol the MIC of E. coli ATCC® 25922™ and E. coli PIG 01 was decreased from 8.0 to 2.0 μg/ml. To exclude cytotoxic effects of mepyramine on the growth of E. coli, the ratio of viable and dead bacteria cells were determined. The positive control showed 98% viable cells and the negative control 100% dead cells. All mepyramine suspended samples of E. coli exhibited 100% viable cells. The antibacterial effect of antihistamines described by El-Nakeeb et al. was confirmed in the present study for concentrations of 1000 μg/ml mepyramine. Additionally, it was found that mepyramine was able to enhance the antibacterial effects of amoxicillin, sulfadiazine combined with trimethoprim, colistin, enrofloxacin, tetracycline and florfenicol against E. coli ATCC® 25922™ and E. coli PIG 01. This is not a cytotoxic effect as shown in the present study due to 100% living cells after mepyramine incubation for 24 h in different concentrations. Possible mechanisms for the enhanced efficacy of antibacterials in presence of antihistamines were already discussed by El-Banna et al. , but the exact effect seems to be unclear. El-Banna et al. argues that the enhanced efficacy should be caused by an inhibition of bacterial efflux pumps by antihistamines. They also mentioned an inhibition of biofilm formation for the antihistamine promethazine by inhibiting quorum sensing. Another idea is based on the main structural feature of antihistamines, a tertiary amino group and a lipophilic aromatic moiety, hence they possess certain surfactant-like characters . Possible properties like this might cause alterations of biological membrane permeability [10, 11] which could negatively affect the bacteria. Hagmar et al. showed that antihistamines could influence bacterial cells by binding to the minor groove of the bacterial DNA and intercalating between the base pairs. It can be hypothesized that bacteria like E. coli produce histamine under stress conditions possibly as a protection against environmental factors. Postulating that this effect is mediated via bacterial histamine receptors, histamine receptor antagonists could interact with this mechanism. Therefore, the efficacy of antibacterial agents should be enhanced. These assumptions have to be proven by further studies. Antihistamines have been classified into two generations, the first-generation and second-generation and moreover in various chemical groups: the ethanolamines, ethylenediamines, alkylamines, piperazines, piperidines, phenothiazines and others . The results in this study for the ethylenediamine mepyramine were compared in single experiments with the ethanolamine diphenhydramine and for the second generation antihistaminic drug the piperazine cetirizine and for others azelastine. In the current study, an antibacterial dose reduction was confirmed only for a combination with the first generation antihistamines, which is in contrast to El-Banna et al. , who found similar effects for different antibiotics in combination also with cetirizine on the growth of Klebsiella pneumoniae. Second-generation H1 antihistamines are newer drugs that are much more selective for peripheral H1 receptors . It could be imagined that bacteria may have unspecific binding sides for antihistamines, therefore cetirizine and azelastine are not able to effect because of their specificity. Based on the present study this difference in chemical structure may be the reason for the shown enhanced efficacy only in combination with the first generation antihistamines. Furthermore, the combination with mepyramine enhanced the efficacy for six of the used antibacterials. No effects on the aminoglycosides gentamicin and kanamycin in combination with mepyramine were shown, which is in contrast to the study results of El-Banna et al. , where an enhanced efficacy was shown for the combination of cetirizine and diphenhydramine on the growth of Klebsiella pneumoniae, as well. These in vitro findings need to be confirmed in vivo. Besides, more research is required to answer the raised questions and to get a better idea of how bacteria, histamine and antihistamines are interacting. The combined use of antihistamines and antibacterials might be a potential option to treat infectious diseases in future and to reduce the absolute amount of antibacterials used therapeutically. Two different E. coli strains were used. The first strain, Escherichia coli ATCC® 25922™ (American Type Culture Collection, Manassas, VA, USA) represents a reference strain for antimicrobial susceptibility testing and is sensitive for enrofloxacin (MIC ≤ 0.03 μg/ml). A second strain (E. coli PIG 01) was isolated from pigs in own experiments and exhibits an MIC for enrofloxacin of ≥ 16 μg/ml. Mepyramine maleate was obtained from Tocris Bioscience (Bristol, UK) and Sigma-Aldrich (St. Louis, MO, USA). Cetirizine dihydrochloride, azelastine hydrochloride, diphenhydramine hydrochloride, amoxicillin, sulfadiazine sodium salt, trimethoprim, enrofloxacin, colistin sulfate salt, gentamicin sulfate and kanamycin sulfate were purchased from Sigma-Aldrich (St. Louis, MO, USA). Tetracycline hydrochloride was obtained from Carl Roth (Karlsruhe, Germany) and florfenicol from Cayman Chemical Company (Ann Arbor, MI, USA). All agents were directly diluted in M9 minimal medium (described below), except florfenicol, which was first dissolved in 10 μl dimethyl sulfoxide (DMSO), and enrofloxacin by adding 5% of 1 N sodium hydroxide solution. The trimethoprim-potentiated sulfonamides were used at a ratio of 19:1 (sulfadiazine:trimethoprim) stock solution dissolved with 0.5 ml of DMSO in 20 ml M9 minimal medium. M9 minimal medium was used for the cultivation of E. coli strains. This buffered minimal microbial medium is composed of 5 g glucose, 6 g disodium hydrogen phosphate, 3 g potassium dihydrogen phosphate, 1 g ammonium chloride, 0.5 g sodium chloride, 120 mg magnesium sulfate, 10 mg calcium chloride and 20 mg thiamine hydrochloride in one liter double distilled water. 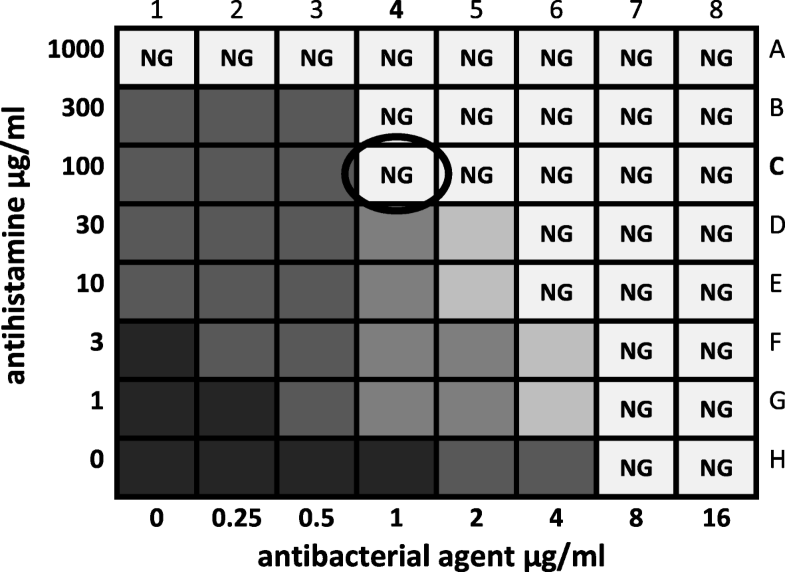 To identify an enhanced efficacy of an antibacterial agent in combination with a non-antibacterial active agent, the in vitro checkerboard method was used . The E. coli strains were subcultured on 7% columbia sheep blood agar plates (Thermo Fisher Scientific, Waltham, MA, USA) for 24 h at 37 °C. An E. coli inoculum was suspended in M9 minimal medium and adjusted to a 0.5 McFarland turbidity standard correlating to 1.5 × 108 CFU/ml (colony-forming unit). The agents were diluted with M9 minimal medium. The checkerboard tests were carried out in 96-multiwell-plates (Greiner, Kremsmuenster, Austria) containing a total volume of 200 μl per well including bacteria suspension. Controls were filled with medium, antihistaminic or antibacterial agent and bacteria suspension. 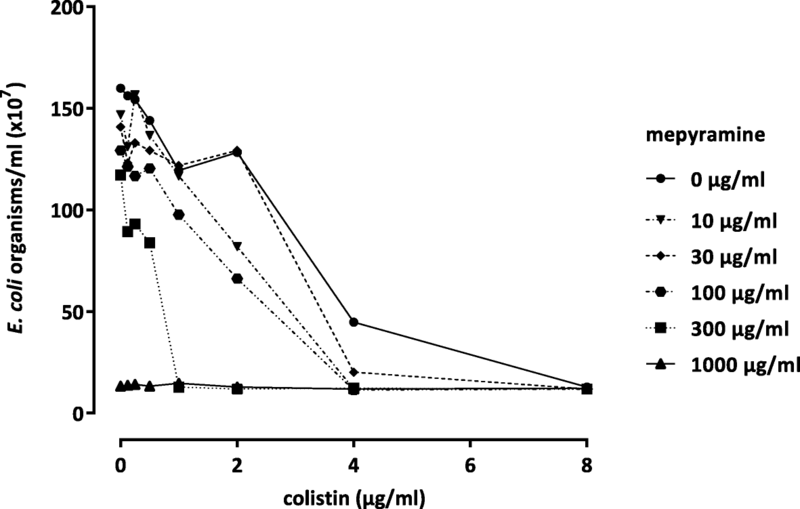 The H1 receptor antagonist was serially diluted along the rows in logarithmic increasing concentrations from 0 up to 1000 μg/ml, various antibacterial agents along the columns starting at zero and ending at two times MIC (Fig. 2). Then each well was filled with an unique combination of the two substances (for example well C4 in Fig. 2 with 50 μl of 100 μg/ml mepyramine and 50 μl of 1 μg/ml colistin). Finally, M9 minimal medium containing 1.5 × 108 CFU/ml was added to the wells. To exclude effects caused by pH changes the pH was evaluated at time points 0 and 24 h after incubation for the combination of enrofloxacin and mepyramine in every well of the 96-multiwell-plate with pH paper (range 1–14, Carl Roth, Karlsruhe, Germany). To determine the amount of viable and dead bacteria under mepyramine stress conditions (30, 100 and 1000 μg/ml mepyramine, incubation time 24 h at 37 °C) the LIVE/DEAD™ BacLight™ Bacterial Viability Kit (Thermo Fisher Scientific, Waltham, MA, USA) was used according to manufactures manual. The assay contains two fluorescent nucleic acid stains (SYTO 9 and propidium iodide). Bacteria with intact membranes (living bacteria) are stained fluorescent green, whereas cells with damaged membranes (dead bacteria) are stained fluorescent red. Bacteria cultures without adding any agent served as positive control. Bacteria with addition of isopropylalcohol (70%, Honeywell, Morristown, NJ, USA) were used as negative control. The stained bacterial suspension was analysed using fluorescence microscopy (Leica, Wetzlar, Germany) by counting the stained bacterial colonies in two visual fields (100 x magnification) at 490 and 546 nm [16, 17]. Statistical significances of differences between MIC values were assessed using the Mann-Whitney U-test (GraphPad Prism version 7.04, GraphPad Software, Inc., La Jolla, CA, USA). Statistical significance was set at a p value < 0.05. Data given in the text and table are presented as median and range. GGB, JM and MK conceived and planned the experiments. GGB, SMK, JM and VF worked out the experimental method. GGB, AFT and ES carried out the experiments. GGB, JM, PH and MK contributed to the interpretation of the results. GGB wrote the manuscript with support from PH, JM and MK. All authors discussed the results and contributed to the final manuscript. All authors have read and approved the final manuscript.